Ok, this one’s a bit old, but I saw it again the other day and remembered how awesome it was. 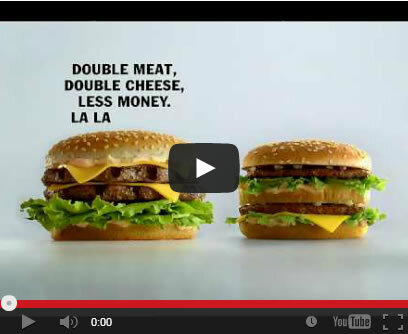 For years McDonald’s has been advertizing the Big Mac like it was the epitome of the burger world. My favorite is Jack in the Box’s Ultimate Cheeseburger. Lisa’s is the Whopper. I always see a line for In & Out Burger which I still don’t understand (they’re not that good, people). I have never heard anyone rave about the Big Mac except McDonald’s (like their French Fries). Well, Carl’s Junior agrees and wants to let you know. Yess! I’ma gonna go get myself one of those. Finally truth in advertizing. Previous Post Previous post: Savvy? Next Post Next post: Bing!